Calling all readers with young children in their lives. 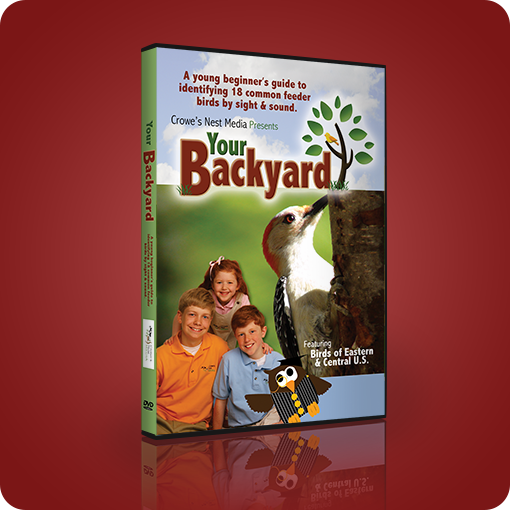 We are giving away three copies of Your Backyard, an educational DVD from Crowe's Nest Media that teaches kids how to identify 18 common feeder birds by sight and sound. This giveaway is open to all readers. Follow the directions on the Rafflecopter widget below to enter. I really enjoy Ray Comfort. How EXCITING! Our family already has the "Your Backyard Series" on the birds and the monarch butterfly and they are both OUTSTANDING!!! My kids LOVE these DVD's made by a homeschooling family. Would love to win!! Thank you! This would be perfect for my 6-year-old. We have been studying birds using Apologia's science program. Thanks for offering the giveaway! Yes, I am familiar with Living Waters. This sounds like a great video to use for our homeschooling. To answer the question, no, I have never heard of Living Waters ministry. I would love to get a copy of this for my younger siblings. They love this kind of stuff. I am familiar with Living Water. It seems like a great ministry! I just love watching birds and would love this dvd to aid me in my identifying the birds.